In-work poverty means that some people are still experiencing poverty, despite holding a job. From 2010 to 2013, EAPN has closely monitored and mapped the situation in Member States, as well as the effect of different policy options towards solving the situation, or making it worse. 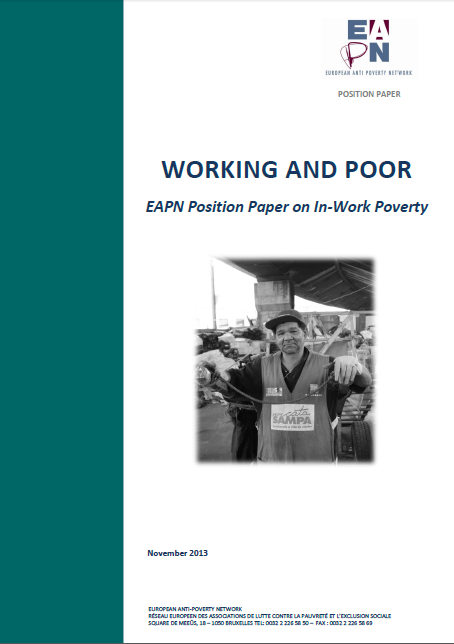 The position paper aims to set out EAPN’s developing analysis of the issue of in-work poverty, and to contribute to the debate, highlighting the different situations across Europe, including the role of low pay, the structure and increased segmentation of the labour market, the role of benefit and taxation policies, and individual characteristics. Building on the extensive work done by EAPN members, key concerns are outlined, and the impact of various policies in different countries discussed, including the negative impact of the economic crisis and austerity measures. The paper brings the stories of the people themselves into the spotlight, and makes a plea for participation and democracy, as the foundation for formulating concrete proposals and ways forward on how to effectively combat in-work poverty. The role of the EU in fighting this growing phenomenon is clearly underlined. This paper was launched in the framework of the Third Annual Convention of the European Platform against Poverty and Social Exclusion, on November 26, during a side-event entitled “In-work poverty – The Contribution of Employment to Poverty Reduction and Inclusion”, co-organised by EAPN together with the European Association of Service Providers for Persons with Disabilities (EASPD) and the European Network of Social Integration Enterprises (ENSIE). Senior Policy Officer Amana Ferro spoke at a European Commission event on 5 February in Brussels, to discuss ethical issues arising in the new world of work that is being ushered in by digitalisation, automation and artificial intelligence. This article in Horizon Magazine was then written.